Brady's model of helmet was banned from the NFL because it did not meet necessary safety standards in laboratory testing, according to ESPN. In total, 32 players from 2018 were wearing a helmet that no longer met NFL standards, the league announced Friday. 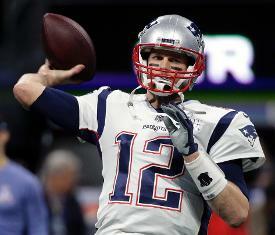 Brady's model was actually deemed inadequate before last season, but players using substandard models were given a one-year grace period to make a change. The NFL and the NFL players Association announced 11 new helmets that were added to the approved equipment list. There were no additions to the banned list this time around. Team equipment managers will be subject to discipline if they facilitate the use of a banned helmet, or know of a player using one, according to ESPN. The NFL and the NFL Players Association have been putting helmets through new testing standards since 2015. The tests, conducted in Canada, include crash test dummies outfitted with helmets that are subjected to various impacts to record how much force is transferred.